Victoria Delgadillo » How Do You Start a Revolution? 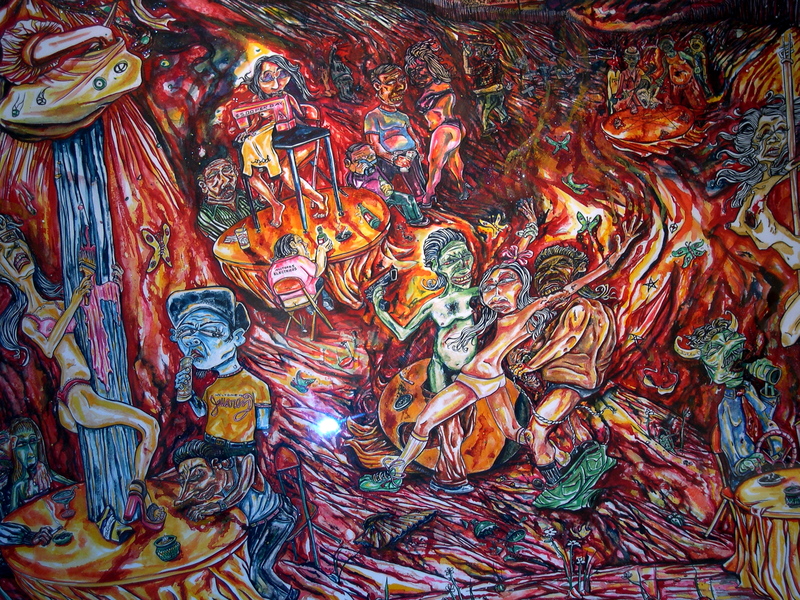 In 2001, Azul Luna founded Las ViejaesKandalosas, a collective of artists with a mission to denounce the murdering of women in Ciudad Juarez, Mexico through art. Her first exhibit called EsesKandalo in 2001, took place at Self Help Graphics & Art in East Los Angeles. In February of the following year photographer Azul along with filmmaker Lorena Mendez-Quiroga led a caravan from Los Angeles to Ciudad Juarez to an invitational protest exhibit and press conference that they had curated at the INBA (Instituto Nacional de Bellas Artes) Museum. El Paso Times award winning reporter, Diana Washington Valdez was the key speaker. Victim mothers and wives of alleged perpetrators gave testimonies. At this time, details and images were not readily available due to a systematic local government cover-up. In addition to selecting artists for Las Hijas de Juarez, it was necessary for the curators to provide details, images and resources for each artist. Several trips to Ciudad Juarez and arduous hours on American police websites began the thread of thousands of cases related to these murders. Before they began curating Las Hijas de Juarez, Rigo Maldonado and Victoria Delgadillo created a strategy regarding the part that art would play in this human rights crisis. Victoria believes in the power of words and therefore did not want the language for the Las Hijas de Juarez to compartmentalize what was occurring as solely a Mexican matter. What was happening in Ciudad Juarez was a case of human rights and justice. Rigo did not want to assume the role of investigator or theorist on these disappearances. He wanted to invoke others to participate in this action. Las Hijas de Juarez Slideshows. In addition to the visual artists on the slide shows below, the following artists also participated in Las Hijas de Juarez: Monica Barriga, Cecilia Brennan, Nikki Campbell, Erika Elizondo, Angela Flores, Xochi Flores, Alicia Gaspar de Alba, Mike Ibarra, Shane Jordan, Angelica Loa, Frank Luis, Rocio Marron, Soraya Medina, Eddika Organista, Tianna Paschel, Minh Pham, Dominique Rodriquez, Aida Salazar, Raquel Salinas, Carolina Sarmiento, Carmen Vega and Brian Walsh. 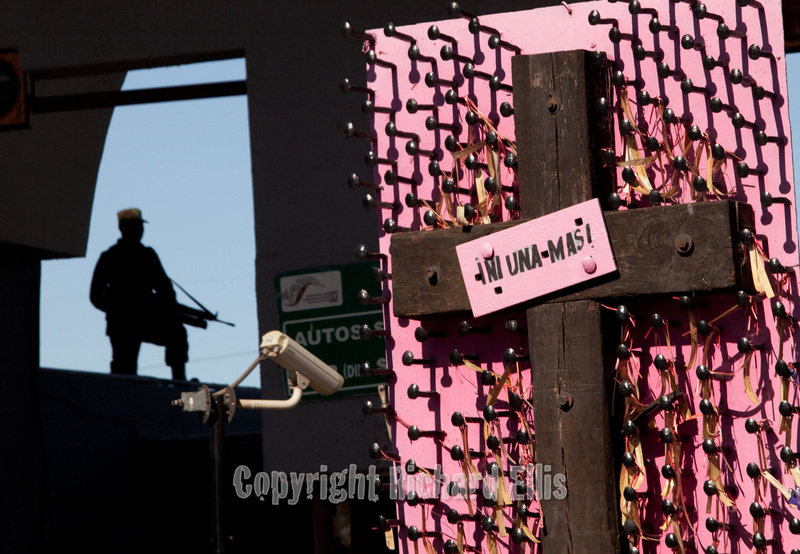 Voces Sin Eco painted crosses everywhere a woman was missing in Ciudad Juarez. “Art which memorializes and honors the dead women through a Day of the Dead celebration cannot simultaneously symbolise the brutality of these murders. Similarly, works which focus on bodily trauma and murder cannot effectively memorialize these lives. By examining the curatorial measures that were taken to organise the works by Delgadillo and Maldonado, I argued that Hijas de Juárez created a space in which the limitations of representation are exceeded through collective juxtaposition. The open dialogue of the works evoke the Juárez situation, and yet also heals, in a way that single interpretations – including political ones – never could. This is a unique function of art as I see it. ” – Lance Richardson, Masters Candidate in Literary Reportage NYU.